Do you want to vape without any fuss or hassle? Of course you do, that is the whole point. Vaping is becoming more and more popular and those wishing to start or make the switch from cigarettes can understandably, feel a little intimidated. There is such a wide range of vaping devices and accessories on the market. If the idea of buttons, LED screens, firmware, and menus leave you feeling overwhelmed, not to worry. SMOK has you covered with the Rolo Badge vaping device. 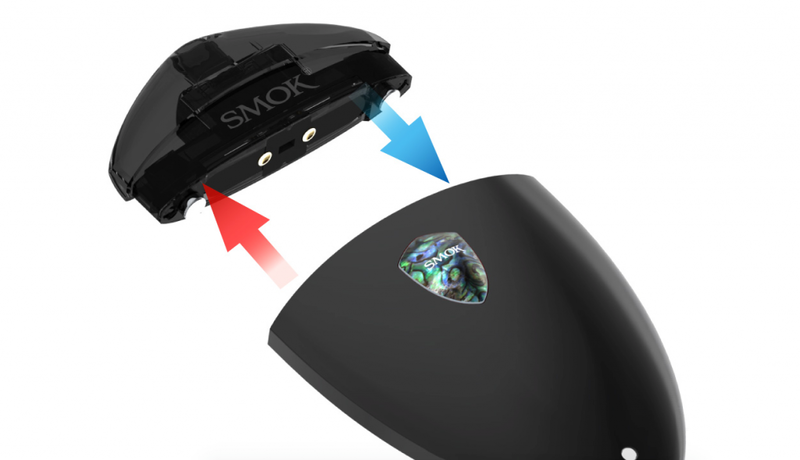 No buttons or fiddly things here, the SMOK Rolo Badge is the perfect introduction to the world of vaping. It’s a no frills, no fuss pod system that is designed for ease of use, convenience and portability. SMOK make vaping easy to appreciate. Let’s check it out. So, what is a pod system? For the uninitiated, a vaping pod is a vaping device that is just a step up from the basic e-cigarettes on the market. Although the concept is similar, they do not share the advanced characteristics of the larger full sized vaping device options available. Novice users or those who are making the transition from smoking regular cigarettes may find the large devices a bit cumbersome and confusing to use at first. The vaping pod has been designed with these people in mind. Not that advanced users don’t enjoy them too! These devices are called pod systems because they use pods, small refills of e-liquid. Many pods on the market come with prefilled pods with a variety of flavors. More recently, newer models allow the user to fill the pods with whatever e-juices they may have a preference for. The pod vaping system is all about on-the-go simple vaping and compactness of size for easy portability. The Rolo Badge should not be compared to most other vaping devices such as the almighty box modor a pen style vaping device, they are completely different devices in form and function. These pod mods are designed with a lower wattage in mind so don’t go in expecting vast plumes of vapor like their larger, more bulky cousins. 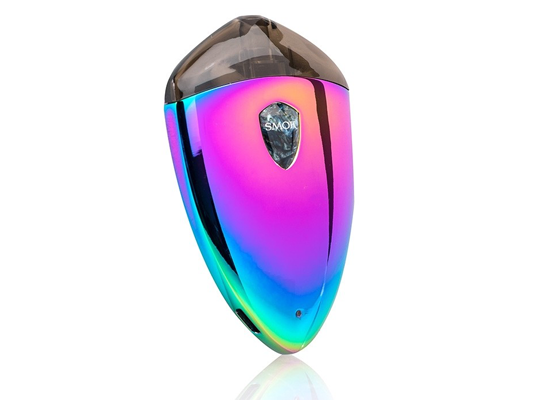 The idea in the design of a pod mod is for it to be a cost-effective and portable device for those new to vaping or making the switch from cigarettes without putting a massive dent on the wallet. Right, so now that we know what the Rolo badge is and who the ideal user base it’s targeted at, let’s jump in and review the vaping pod. The first thing you will notice about the device is the unique shape. The shape is similar to a traditional metallic police badge or teardrop which sets it apart from other vape devices which are more often than not pen style or box style devices. 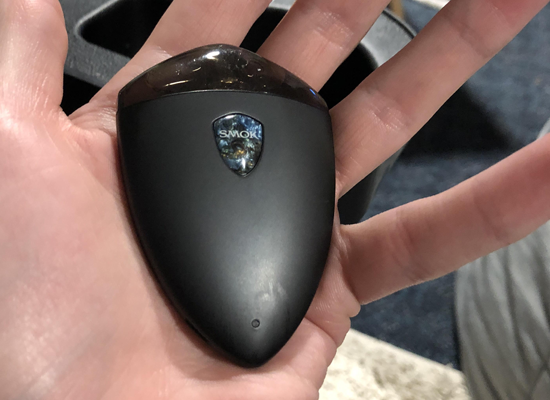 There are no distinguishing markings on the pod beside the SMOK branding and a small LED light which indicates the status of the pod and the battery life. The Rolo pod is built in two sections, the main body of the pod containing a 250mAh (milliamp hours) battery and the refillable and replaceable pod system which fits neatly on top of the device. One of the handiest features of the Rolo Badge is how the replaceable mods attached magnetically as opposed to using friction sealing or clips. The magnetic attachment makes the refillable pods easy to remove and replace. The pod contains an e-liquid tank that holds up to two milliliters of e-juice and houses the coil and drip tip. This gives the Rolo Badge fewer working parts to fiddle with making it an ideal device for the novice vaper to fire up and enjoy. Weighing in at only 62 grams the Rolo Badge is designed to be extremely portable and easily carried in the pocket for a quick vape on the go. There are a number of nifty colors and finishes for you to choose from. These include Black, Gold, Blue, Chromium, and a funky rainbow design. There is even a rubberized version available. SMOK have also included a micro USB port to the device for easy charging. As the battery is only 250mAh the device charges quickly. Available in a range of eye-catching colors and finishes as can be seen in the picture above and according to SMOK, there are more on the way! 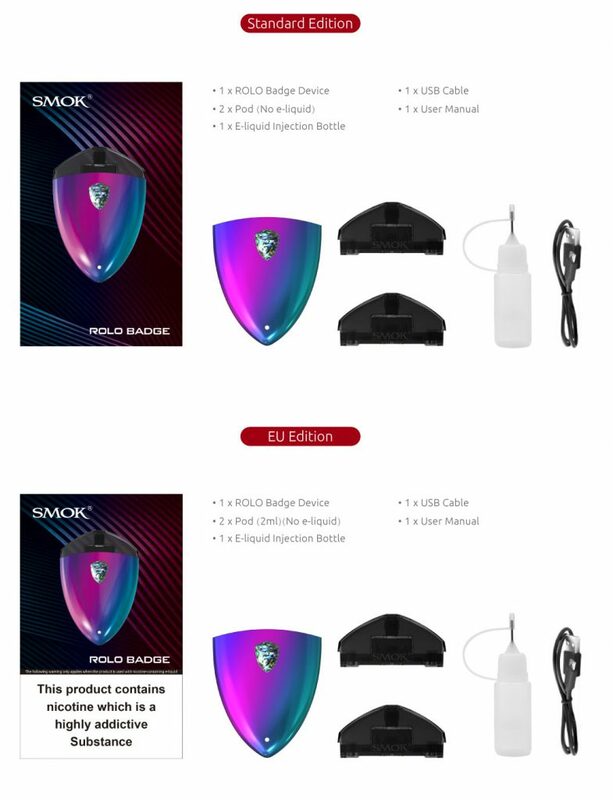 The Dimensions of the SMOK Rolo Badge are 73.3mm x 50mm x 12mm, keeping the device compact and discreet if you want to take a quick puff on the fly.